Halloween safety may be the last thing on your radar. After all, you're either out trick-or-treating, at home handing out candy, or hosting a spooky party. Is there really anything that scary to think about? Actually there is. And it's not ghosts, goblins, ghouls, or things that go bump in the night. 40% of parents allow one or more unsafe items in their child's costume, including masks, long or loose clothing, and a sword, stick, or other sharp object. If you do have some fear around Halloween that's not caused by horror movies, you're not alone. But you shouldn't have to feel fearful as you host a fun get-together or as your children go trick-or-treating. That's why it's important to be informed and take the proper precautions to promote safety. Who Ya Gonna Call? – Put emergency identification on costumes or on your child's wrist. Include name, phone number, and address in case they get separated. Check It First – Dangerous paint ingredients can cause serious harm to young children. Make sure you know exactly what's in your child's face paint. Masked Dangers – Young children shouldn't wear masks. Depending on the child's size, they could cause breathing problems or obstructed vision. Treat Inspectors – Make sure you look at all of your kid's candy first. Throw away any unwrapped or unsealed pieces. Don't Drive – If you're able, avoid driving during trick-or-treating. Be Alert – If you're driving, always watch for children crossing the street. Likewise, if you're out with your kids, make sure the road is clear. Never Drink & Drive – Halloween is a great time for parties, but sometimes that means drinking. Never get behind the wheel after you've had alcohol. Stranger Danger – Never go inside a stranger's house. Pet Problems – Watch out for animals. They may be confused by all the Halloween happenings and act aggressive. Carry a Light – Take a flashlight with you, so you don't trip or fall on anything dangerous. See Clearly – Take your mask off in between houses, so you're better able to see. Party Safe – If you're having a party, don't provide alcohol to minors. Know the Social Host laws of Pennsylvania. 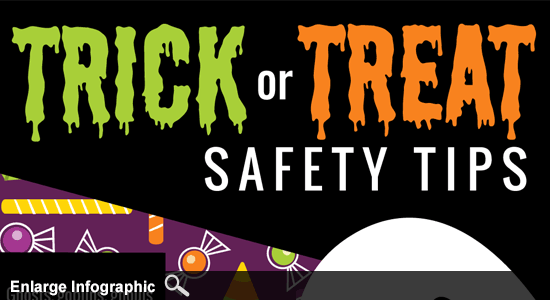 "Halloween Safety: A National Survey of Parents' Knowledge, Attitudes, and Behaviors." Safe Kids Worldwide. 2011.